A basic that’s been making the rounds in my wardrobe is the J.Crew Endless shirt – it’s such an easy go-to for everyday wear, and can be styled so many different ways! I’m not sure whether it was named the Endless shirt for it’s length or because of its versatility, but both meanings work! I adore the tunic length and the classic, structured fit of this shirt. While it looks wonderful worn alone (the cuffs are the coolest), I thought topping it off with my leather crop would be a fun and unique way to layer, while also cinching in my waist! A lot of designers created similar crop tops and leather shells for winter wear this season, because it’s a chic alternative to the sometimes drab work shirt. A few examples include this Theory leather shell (on sale! 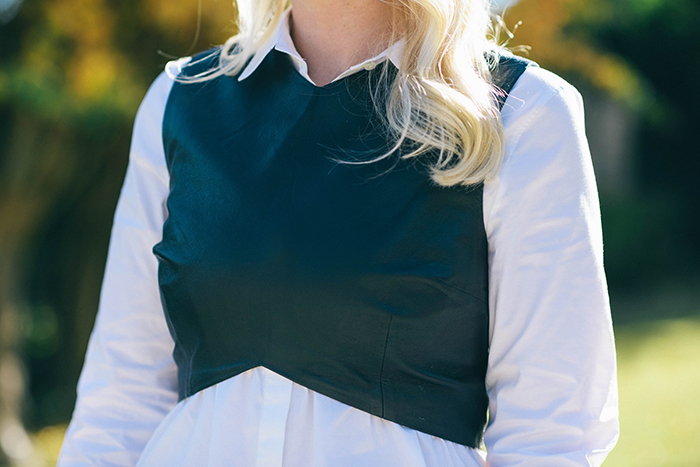 ), this leather ribbon top by Alice & Olivia, and this angular Milly shell. I also feel like this Michael Kors bustier would look killer over a a white shirt and jeans too – a little aggressive? Yes. Totally awesome? Yes. 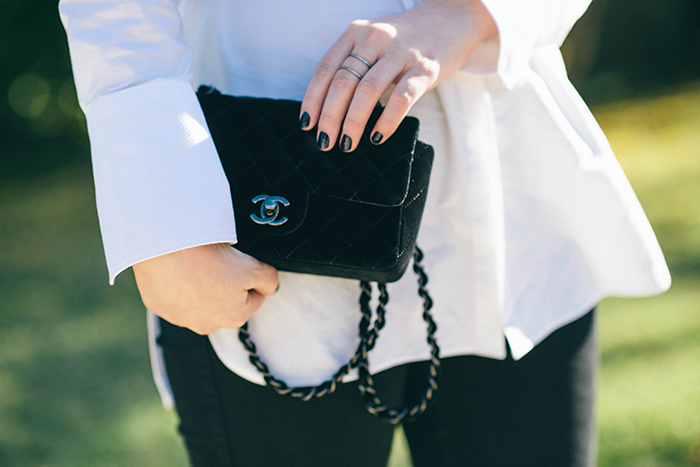 On another note, how adorable is this mini velvet Chanel? Another piece I want to steal borrowed from my mother’s impeccable closet. I always find such treasures in there… A new find that actually is mine is this pair of Prada pumps I picked up last week! As I mentioned earlier, I really haven’t been great at stocking my closet with classic shoe silhouettes – these sleek patent pumps have gotten me a step closer to a more well rounded wardrobe, don’t you think? It’s a real chore to make my big feet look pretty, but these shoes do it with ease. This is probably one of my favorite look of yours,I love every single item. Gorgeous! Love that darker nail color on you and your new heels are so pretty! Love how you layered the crop top over that shirt! 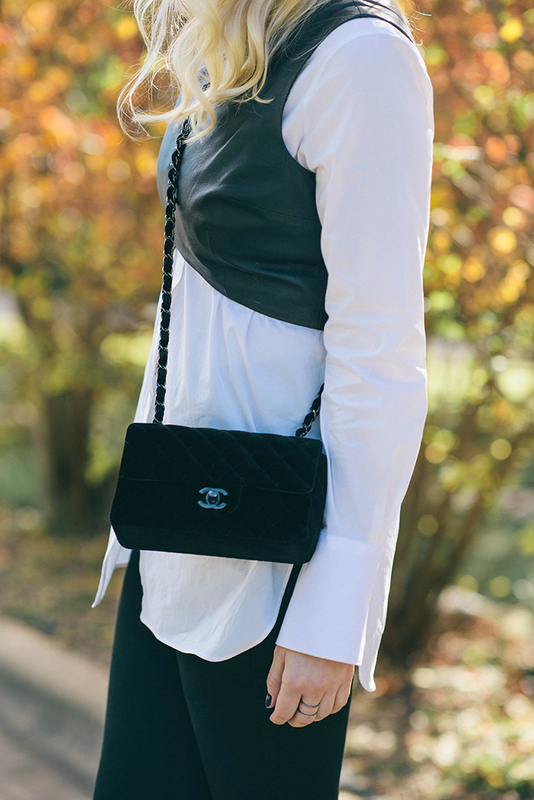 Love this twist on a classic white button down look. Very chic! Gorgeous darling – love these layers! Gorgeous, that top is so cool, the layering is so great! This is so pretty! 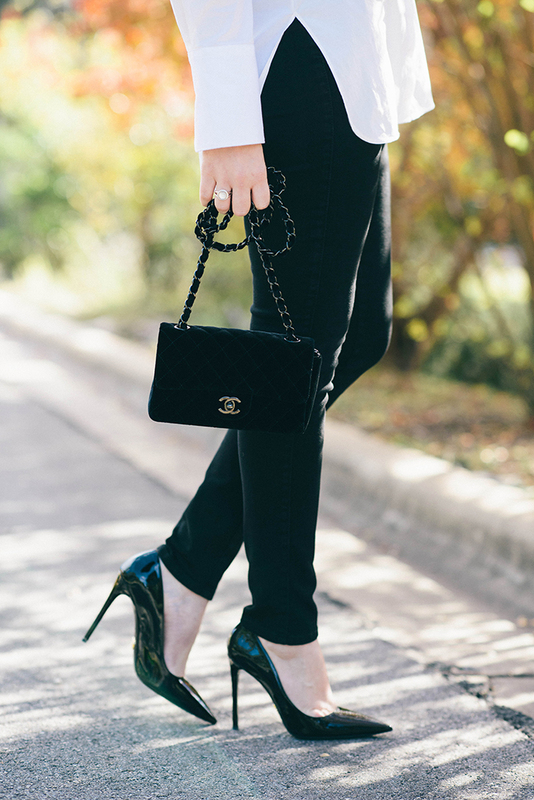 Nothing beats a classic patent leather pump, and I am dying over that mini bag! absolutely LOVE how you layered the crop top here; so pretty! I’m doing a more casual take on black and white (reversed it with white pants today).., such a classic. Loving this minimal chic ensemble, especially those gorgeous Prada heels and your velvet Chanel purse!!! This outfit is awesome…I tried the endless shirt in a stripe! LOVE this Merritt! Such a cool way to wear that black crop top! You look darling! Adore the layering and you always kill the b&w look, lady! Oh girl I loooovvee this look! 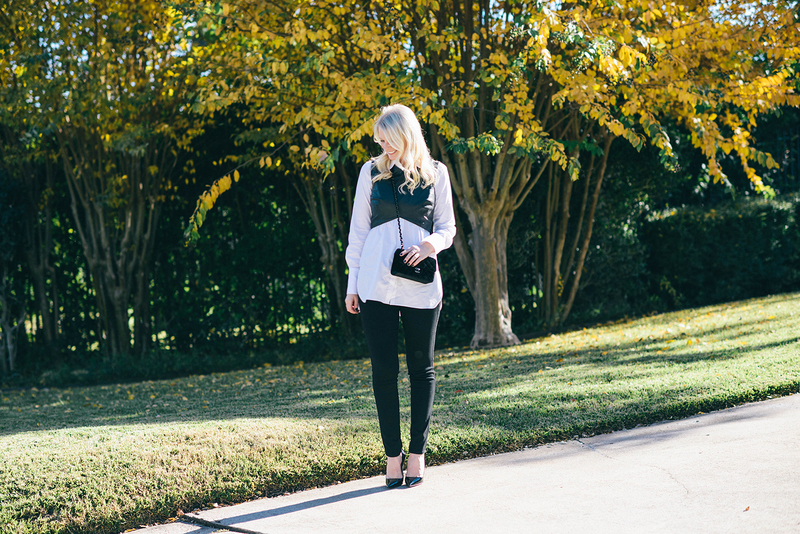 The black and white is so chic, and the shorter black top layered over longer white gives it such a unique look. Those pumps are beautiful! I love how you wore a crop top over this! I would have never thought about that, so cute! I just love how you layered the leather top over the long shirt! And that bag is divine! Love this look! And, can we talk about that Chanel bag?! Perfection. Absolutely obsessed with this look! I love the balance of fun, trendy pieces with classic pieces! Love how you styled that cropped top, looks great over the shirt! I love it when there’s something in our closet that we can wear over and over again. Great outfit. so pretty, love the layering!